This is a larger version of the Door name plate, It's perfect for adding two names. If you want something fun and personal for a child in your family, then my personalised door plaques are a fantastic option. With a design that’s specific to you (no two plaques are the same), they make for a funky and colourful addition to any bedroom or playroom. 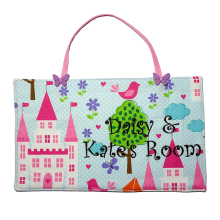 Why Buy a Personalised Door Plaque? My door plaques are ideal if you want something to hang on your child’s bedroom door, or if you’re looking for nursery name plaques or something for their den. I have various different fabrics available to work with and, as everything is handmade, I can tailor all of the items to give you a bold and attractive plaque that can hang almost anywhere. 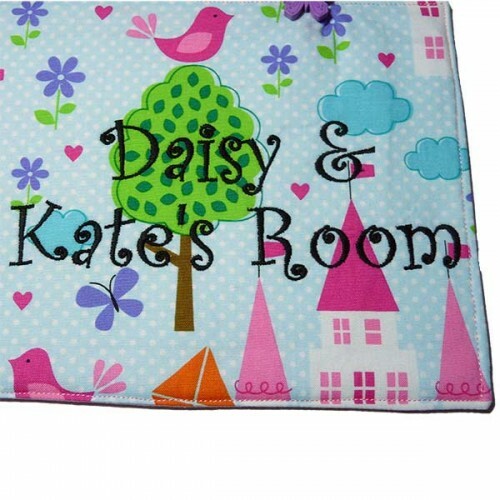 I put a great deal of care into all of my personalised gifts for kids, so that you can be sure of a high quality plaque when you place your order. I’m proud to be able to express my creativity, whilst creating something that will last throughout their childhood. 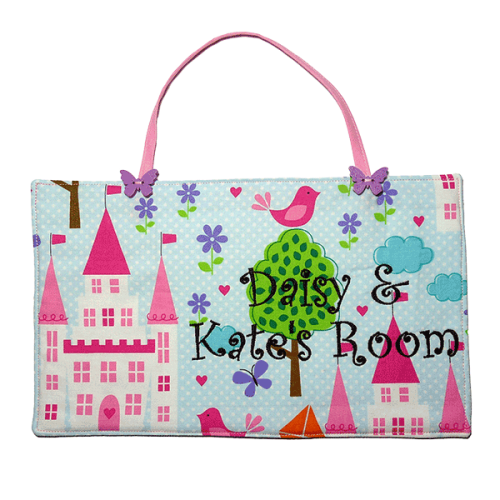 Once I have the details for your personalised door name plaque, I’ll find the perfect fabric with which to make it. I prefer to use wool mix felt and then a combination of plain and patterned cottons to make your item, because this gives me plenty of scope to customise the design. I’m able to create exactly what you’re looking for with the materials I choose, at the same time creating a bright and strong name plaque that will last through the years. Sometimes I’ll use freehand embroidery on my most creative and unique designs, and because I know that you’ll be excited to see what I’ve made I guarantee to have shipped your purchase within 14 days. 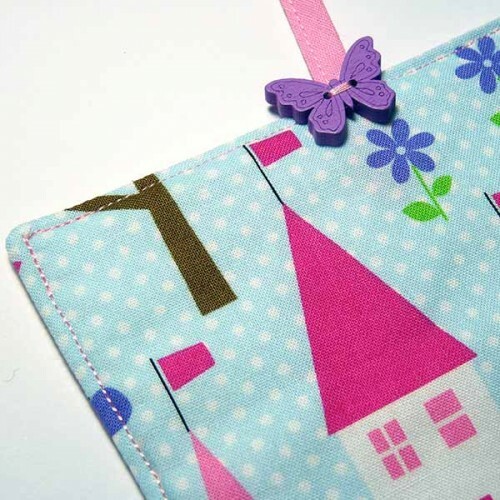 Door Plaques measure 29cm x 14cm approx. All you need to do to order one of my children’s door name plaques is add one to your cart and fill as much detail as you’d like into the ‘Personalisation’ box. Add the child’s name, what colours and styles you’d like me to use, and any other useful information that will help me to bring your vision to life. Name – Jacie. Colours – pink. Style – very girly, also loves cats. Once I’ve got this, I can start putting together something that I’m sure your child will love!